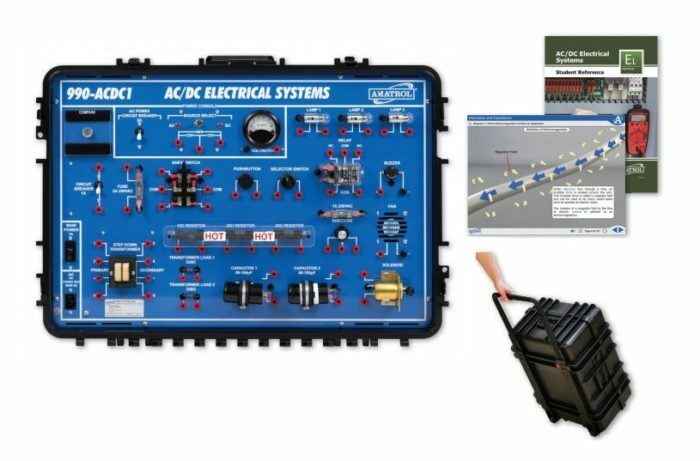 Amatrol’s Portable AC/DC Electrical Learning System (990-ACDC1) teaches the fundamentals of AC and DC electrical systems used for power and control in industrial, commercial, agricultural, and residential applications. The 990-ACDC1 offers industry-relevant skills including how to operate, install, design, and troubleshoot basic AC and DC electrical circuits for various applications. This portable AC/DC electrical learning system brings customers flexibility and convenience when there’s a need to use a trainer in multiple locations or where space is too small for a full-size trainer. The 990-ACDC1 includes a variety of switches and other components so learners can build different circuits, which will help them to recognize industrial component styles and learn how to troubleshoot them effectively. Combined with Amatrol’s world-class curriculum, this innovative product can provide learners with a thorough understanding of electrical power. With only desk space for the 990-ACDC1 and a computer, anyone can attain a full array of AC/DC electrical training and learn about the fundamentals of this vital area. Electricity is used worldwide for innumerable applications and forms the base for areas such as electrical motor control, electro-fluidpower, and programmable controllers, so a strong understanding of this subject is necessary for many professionals. In this learning system, electrical topics covered include concepts like Ohm’s Law and Kichhoff’s Voltage Law and real-world components including switches, solenoids, and digital multimeters. Learners can then use this in-depth knowledge about electricity to complete skills such as operating a circuit using a circuit breaker, connect and operate a relay in a circuit, and connect and operate a basic lighting circuit. The 990-ACDC1’s extensive multimedia curriculum begins at the foundation of electrical power by defining electricity and then building onto this fundamental knowledge by advancing to topics such as transformers and combination circuits. As the learner completes each new topic, they’ll use this theoretical knowledge to complete hands-on electrical skills like connecting and operating an electrical circuit with a resistor, using a digital multimeter to measure voltage, and troubleshooting a transformer. By combining theoretical electrical systems knowledge and hands-on electrical circuit skills, the major concepts of electrical systems are ingrained in a learner’s mind.